Sealing grout is one of those tile tasks that is easy enough to do but pays back big. If you don't mind using a rolling applicator or a spray can every so often, you can save yourself loads of cleaning time down the road and possibly even save the tile itself. To understand why grout sealant is so important, it helps to know some backstory about the nature of grout itself. Ceramic, porcelain, or stone tile is laid in a bed of mortar and left to cure. 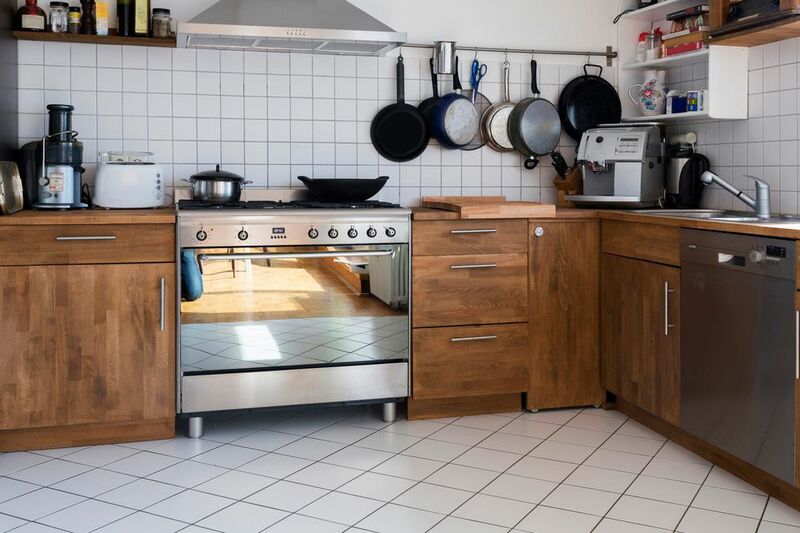 At this point, there are open seams between the tiles. When the tile is solid enough in its mortar that it will not shift around, grout is smeared across the face of the tile with the edge of a soft rubber float. As the grout reaches a seam, it is deposited in the seam and collects there. As long as the rubber float maintains its light pressure, the grout will remain in the seams. The rubber float continues to scrape grout off of the tile face, picking up the vast majority of the excess. The final, small amount of excess stays on the tile face in the form of grout haze: a layer of minerals so fine that only a special grout haze cleaner can pick it up. Tile grout works in two significant ways. First and foremost, it keeps debris out of the seams by displacing those open areas. Second, grout is a minor structural element that holds the tiles together. As an added benefit, grout adds to the beauty of the tile. If you choose color-tinted grout, the grout is far more than functional: it is an aesthetic device. Tile is so multi-purpose that it can be used anywhere: kitchen floors, bathroom floors, kitchen backsplashes, and even in high-moisture spaces like the bathtub and shower. Depending on the location, tile might get zero or very little moisture or it can be absolutely deluged with moisture, in the case of those tiled tubs and showers. Because cement-based grout is porous, those pores allow water to percolate inside, much like rainwater seeping into outdoor concrete. By applying sealer, you are, in effect, beating the water to the punch. You are flooding, permeating, and completely occupying the porous grout structure with a stable, hard, and non-porous substance long before the water can move in. Preventing water from entering grout pores helps avoid mold and mildew from growing. Also, if water seeps through the grout, it can reach the back of the tiles and cause irreparable damage. A number of tile installations do not need grout sealing. Tile applied with epoxy-based grout does not need sealing. Any kind of tile that is purely decorative like wall medallions or dry tile wall wainscot can go without sealing. With this method, each grout line is brushed individually with a small brush and sealant. Since the surface of the ceramic tile is glazed, it is already sealed. Tile grout sealer needs to be applied only to the grout lines and nothing else. This type of grout sealer usually comes with an attached brush-tip or roller-tip. Gardening knee pads or a folded up towel help protect your knees as you crouch down to apply the sealant to each line. If you smear some on the surface of the tile, it will eventually come off. But you do want to try your best to keep it away from the tile surface. Pros: Though more manual labor is involved, you target the sealer only on the section that needs it, the grout. This method coats the grout thicker than with the spray method. Cons: Brushing on grout sealant is tedious, taxing work. If you have knee or back problems, go for the spray method. Products: DuPont's Grout Sealer effectively seals your grout lines, with each 4-ounce bottle covering 30 linear feet. Brush tips tend to work better than foam roller tips. Another way to seal grout is by spraying the entire surface with a grout sealer. The theory is that the grout sealer penetrates the porous grout, yet lays atop the glazed tile surface. Then, the sealer on the glazed tile partially evaporates and partially wears off after usage. Reviews of spray-on grout sealant are mixed. Some homeowners say that this spray-on sealant does not percolate into the grout as well as the brush-on sealers. Also, there are some reports of this sealant damaging the tile caulking. Pros: It is far easier to spray everything instead of painting grout lines individually. Plus, ease of use may encourage homeowners to seal their grout more often. Cons: Far more product is wasted by spraying than by brushing on grout sealant. Products: Push-button aerosol sprays tend to produce a finer, more consistent mist with fewer drips than do the hand pump sprays.